The purpose of the Tree Planting Program is to introduce properly spaced, quality trees to Village parkways. The long-term goal is to form a street corridor by increasing the tree quantity and the amount of tree canopy foliage that occupies the space along the public streets. Village forestry staff coordinate all tree planting activities and manage the associated budget. There are no direct costs, charges or fees to residents for a parkway tree planting. 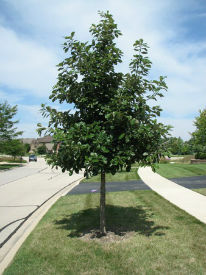 If you are interested in a new parkway tree planting, contact the Village Forester at (630) 434-5475 or by email.